Nelson’s Victory is a surprisingly fun take on what’s a fairly bog-standard casino game. 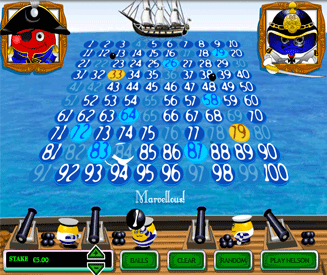 If you were to breed the game of keno with the game of Battleships, Nelson’s Victory would be it’s lovingly entertaining offspring. The object of the Nelson’s Victory game is to pick up to 12 spots (out of 100) in a body of water. Cannonballs will then be fired in to the water from both sides. The more Cannonballs that hit your selected numbers, the more money you will win. Note: No, you’re not the only one that thinks the captains actually look like M&Ms in pirate outfits. Now, that sounds all well and tasty, but throw in some massive potential payouts and you’ve got a very appealing real money game on your hands. Nelson's Victory rating - 77%. The coolest aspect of Nelson’s Victory is that it’s going to appeal to both keno fans (all 30 or so of you) and those of you that just enjoy playing fun games for a little bit of money. Honestly, even if you’ve never heard of keno before and couldn’t really care less about it, you’re still going to enjoy what Nelson’s Victory has to offer. As with any old keno game, the variable odds and tremendously huge potential payouts are awesome. However, keno isn’t always the most visually appealing game in the world - but that’s where Nelson’s Victory comes in. "Nelson’s Victory" takes a plain, familiar game and hits it with an uppercut of gameplay and a right hook of fun to finish it off. It’s a very good effort indeed. How to play Nelson's Victory. Select up to 12 numbers/spaces out of 100 in a body of water. Choose to play as either Nelson or Bismarck. Watch the cannons fire and hope you hit (or miss) enough numbers to win money. In Nelson’s Victory you can play as either Nelson or Bismarck. If you choose to play as Nelson, you want to hit as many of your chosen numbers as possible. If you play as Bismarck, you want to try and miss all of your chosen numbers. There are 100 numbers/spaces in the middle of a body of water. You can choose between 1 and 12 of the spaces for each game you play. In addition, in each game you can choose to have either 12 or 24 cannonballs fired in to the water. The number of cannonballs and the amount of numbers you choose in the water will affect the payouts in different ways depending on who you play the game as. If you choose to play the game as Nelson, you want to try and hit as many of your chosen numbers as possible. The more numbers you select, the bigger the payout will be if you hit many of them. The less numbers you select, the lower the maximum payout will generally be. I’ve definitely worded that awkwardly, so let me give you a quick example. Quick playing as Nelson example. If you only choose two numbers, it’s far more likely that they will both get hit than it would be to select 12 numbers and have all 12 of those numbers get hit. Honestly, I think you’re better off just giving the game a try. You’ll understand what I mean when you start picking numbers for yourself. If you choose to play the game as Bismarck, you want to avoid hitting any of your chosen numbers. The more numbers you select, the bigger the payout will be. The less numbers you select, the lower the maximum payout will be. Fact: If any of your numbers are hit when playing as Bismarck, you lose. All of your chosen numbers must remain untouched for you to win money. The more numbers you select, the more likely it is that at least one of your chosen number will get hit with a cannonball, therefore the payouts increase with the more numbers you select. Conversely, the fewer spaces you choose, the more chance you have of not being hit. Therefore the payouts will be lower. In addition to being able to choose the number of spaces you select (between 1 and 12), you can also choose the number of cannonballs that will be fired in to the water. You can choose to play with either 12 or 24 cannonballs. If you choose to play with 12 cannonballs. The payouts for playing as Nelson will increase. The payouts for playing as Bismarck will decrease. If you choose the play with 24 cannonballs. The payouts for playing as Nelson will decrease. The payouts for playing as Bismarck will increase. As you should already know; the less likely the outcome, the bigger the payout.